Lone Star Saddlebreds competes year-round at local, regional and national-level competitions. We are a goal-oriented barn, and competing in the show ring is our ultimate goal. Whether you are an academy rider on one of our school horses or a performance rider with a horse of your own, there are many opportunities for you to work on perfecting your skills in the show ring. Click on our competition calendar for more information about where we are headed next and our photo gallery to see our teams in action! Developing a relationship with a horse so that you can work as a team in the show ring is much more difficult than it looks. Hours of practice along with dedication in and out of the barn are required to find personal success along this adventure. Attention to detail is needed which requires absolute concentration and commitment on the part of the rider. Developing a feel for your horse takes time and patience – it doesn’t just happen magically. This is a process that can last a lifetime! Along the way, life lessons are learned and character is built. Horses may come and go over the years and with each of them, you learn a little more about horsemanship and about yourself, too. The trainers and instructors at Lone Star understand this process because we have lived it, and we find it rewarding to help our riders set and achieve goals with horses that are well-suited for them at the time. We understand that as a rider evolves, they will most likely need to progress to a different equine partner in order to keep learning. Finding just the right match for our horses and riders is one of our strengths. We like success in the show ring just as much as our horses and riders do; therefore, we work hard to give each team our very best effort possible to find that success. We take our competitions seriously! We give 100% of our effort towards preparing our show horses for competition, and we count on our riders to prepare themselves in the same manner. Our show riders are asked to ride a minimum of twice per week consistently and to follow a personal fitness regime to stay in shape year-round in order to do their best. Our philosophy is that both horse and rider are athletes – staying physically and mentally fit is paramount. Our equine athletes get the best daily care, veterinary services, farrier services and even massage therapy. A little playtime now and then keeps them mentally fresh, too! 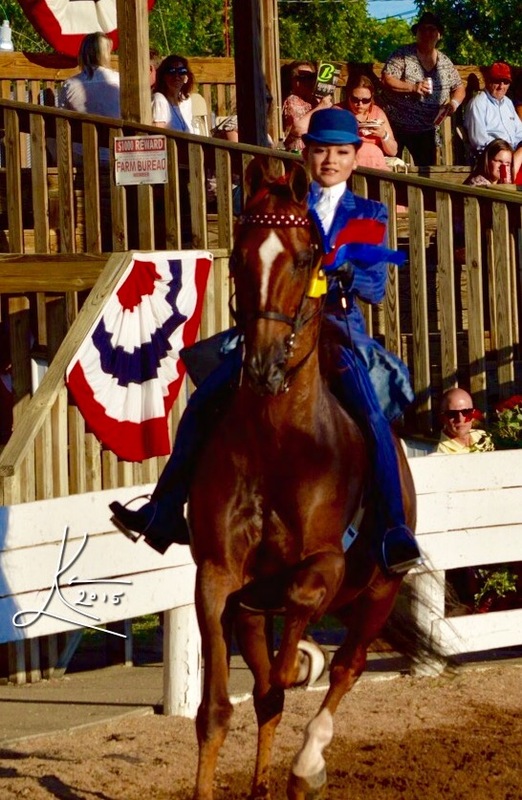 For the most part, American Saddlebreds love to show-off and enjoy hearing the crowds cheer for them. They have been called the “peacocks” of the show ring and have been compared to dancers because of their grace, elegance and athleticism. Not all Saddlebreds are cut out for the show ring, though – some prefer jumping, cutting, or the precision of dressage… Some make wonderful school horse angels who carefully carry the littlest of students around the show ring teaching them their lessons gently and somehow with just the right amount of difficulty. We are fortunate to have both the powerfully driven show horses and the gentle heroes of our riding academy at Lone Star. We love them all equally! Click on photo gallery to meet some of our Academy Horses.